Our quick connect UTV High Seat is here. 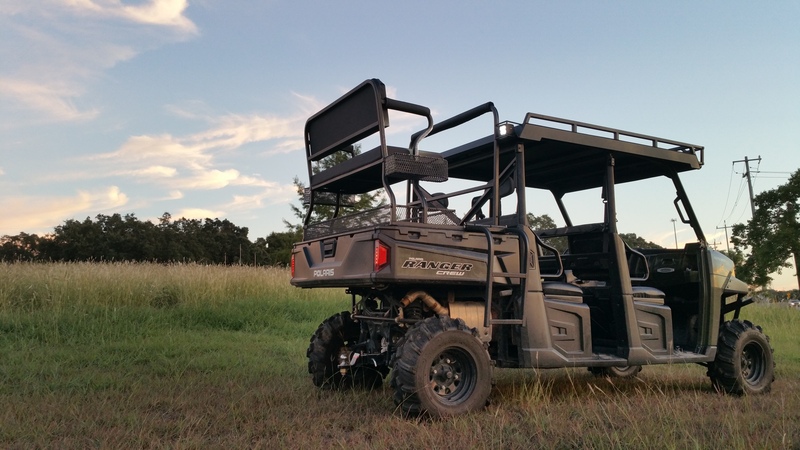 Built primarily for the Polaris Ranger, our new high seat is packed with standard features. Works with 2007-2017 Ranger UTV beds. Four steel pipe/tubes on the bottom of platform extend 4 inches into factory holes/slots on bed-sides creating a very snug and precise fit. 100% born and built here in Texas, we engineered this to address the markets wants and needs. A HUGE foot/standing platform runs the full width of bed making moving around and standing simple. The cushions themselves went through multiple phases of testing, We ruled out vinyl (tears and becomes weak in direct sunlight) and went with an automotive-grade convertible top canvas. The cushions are UV and water resistant fitted over a firm marine-grade foam. Easily adjust removable rifle rack 7 inches up or down. Yes, high seat will fit through a standard garage door (our most common question) without any issues! A HUGE storage basket ($249 optional add-on) under seat that slides out and is completely removable via two rear bolts to give access to all the valuable bed storage. Dual folding ladders support up to 350 pounds, and can be completely taken off high rack within 30 seconds. The whole high seat has a baked on textured powder coat that will last longer then bed-liner, as well as looks sleeker and easier to clean. Rear Upper Storage (bolt-on) basket is a $350 option. Under-Storage removable (bolts-in) basket is a $350 option. John Deere XUV High Seat that easily connects and disconnects securely! More info coming soon, but available for immediate order!